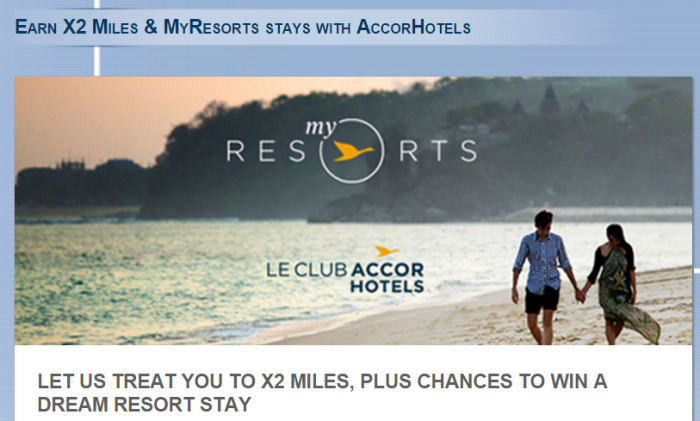 Le Club AccorHotels has launched double miles offer for Cathay Pacific AsiaMiles members. You can earn double miles for stays that are both booked and consumed between November 3 – December 31, 2015. Note that you must have your Le Club AccorHotels earning preference set to partner miles and have Cathay Pacific AsiaMiles chosen as the preferred partner. Seems that Le Club AccorHotels is bit stingy when it comes to bonus miles offers is Cathay Pacific. Other programs have often triple and quadruple miles offers. I would continue earning points with others promotions than take advantage of this one. 1. General Le Club AccorHotels terms and conditions apply to the Double Miles for Asia Miles members offer and you must be a Le Club AccorHotels member to benefit from it. 2. This offer is valid for a stay between “3 November 2015” and “31 December 2015” in one of the participating hotels worldwide, and booked between “3 November 2015” and “31 December 2016”. 5. This offer entitles Le Club AccorHotels Loyalty members, regardless of their status, to benefit from earning Double miles in one of the participating hotels worldwide. The number of bonus points for this offer is calculated according to the points earned by the member based on “Classic” status. 6. To benefit from this offer, your booking must be made on AccorHotels.com or our participating brands web sites or via Accor call centers. All other reservation channels will not be eligible to this offer. 10. In order to benefit from this bonus, the member must have activated Asia miles as preferred conversion option ahead of the stay. 13. The “Double Miles” offer may be modified or terminated in whole or in part at any time and without prior notice. 14. The two members earning the most miles with AccorHotels during the Promotion Period will be determined as the two winners (“Winners”), and will be entitled to a complimentary stay (“Complimentary Stay”) at a participating hotel set out in paragraph 16 below. If more than two members earn the most miles (same amount of miles) during the Promotion Period, the Winners will be determined by the number of room nights completed during the Promotion Period. 15. Each hotel stay referred to in the preceding paragraph has a value of up to United States dollars five hundred (USD500). Conversion of any other currency to United States dollars shall be at the exchange rate in effect on the AccorHotels website at the time of reservation. Rate disparities attributable to fluctuations, rounding up/down and/or differences in currency exchange rates are excluded. In the event that the value of the stay in an excess of United States dollars five hundred (USD500), you shall be directly responsible to the participating hotel for such amount in excess of United States dollars five hundred (USD500). Mercure broome, Mercure kooindah waters, Mercure gold coast resort, Fairmont resort blue mountains,The reef house mgallery, Novotel twin waters resort, Novotel barossa valley resort, Novotel ningaloo resort, Pullman palm cove resort and spa, Pullman port douglas resort, Pullman bunker bay resort, Pullman magenta shores,The sebel hawkesbury resort, Sofitel angkor phokeethra, Pullman sanya yalong bay, Pullman sanya bay resort spa, Pullman lijiang resort and spa, Sofitel shanghai sheshan oriental hotel, Sofitel zhongshan golf resort, Sofitel fiji resort and spa, Sofitel bora bora marara beach, Sofitel moorea ia ora, Sofitel bora private island, Grand mercure goa shrem resort, Novotel goa shrem resort, Novotel visakhapatnam varun beach, Novotel imagica khopoli, Novotel mumbai juhu beach, All seasons bali legian, Ibis bali kuta, Ibis styles bali denpasar, Ibis styles bali kuta circle, Ibis styles bali benoa, Mercure kuta bali, Mercure resort sanur, Mercure bali harvestland kuta, Mercure bali nusa dua, The royal beach seminyak bali, The phoenix hotel yogyakarta, Novotel bogor golf resort, Novotel lombok, Novotel bali benoa, Novotel bali nusa dua, Pullman bali legian nirwana, The kuta beach heritage hotel, Sofitel bali nusa dua, Hotel de la paix luang prabang, Novotel inle lake myat min, Mercure queenstown resort, St moritz queenstown mgallery, Novotel queenstown lakeside, Sofitel queenstown hotel spa, Sofitel philippine plaza, All seasons naiharn phuket, Grand mercure phuket patong, Mercure koh chang hideaway, Mercure pattaya ocean resort, Ibis samui bophut, Mercure hotel pattaya, Veranda resort and spa hua hin, Veranda high resort chiang mai, Hotel baraquda pattaya, Novotel rayong rim pae resort, Novotel phuket resort, Novotel chumphon beach resort, Novotel phuket vintage park, Novotel hua hin cha am resort, Novotel phuket karon, Novotel phuket kamala beach, Pullman phuket arcadia resort, Pullman khao lak resort, Pullman khao lak villas, Hotel de la paix hua hin, Sofitel krabi phokeethra, La residence hue hotel and spa, La veranda resort phu quoc, Novotel nha trang, Novotel ha long bay, Pullman danang beach resort, Premier village danang resort. 17. Any reservation made pursuant to an award of a prize must be completed prior to 29 February 2016, and such hotel stay must be completed prior to 31 June 2016. 19. You will be contacted by Le Club AccorHotels staff between the 1 January and the 15 January 2016 if you have won a prize. You may be contacted by post, electronic mail or telephone at such postal address, email address or telephone number contained in your Le Club AccorHotels membership account.